I have had this recipe bookmarked for far too long. It took my sisters FB post to remind me of the Challah bread that I never got around to making. This was something I never thought I’d get the guts to make years ago – it looked so difficult to me for some reason. I found a YouTube video that demonstrates how to properly braid the Challah and that was super helpful. While baking, the top braid started to tip over, but thankfully it never fell off. Next time I make it, I’ll make sure that the base is even and maybe even a little wider so this wont happen next time. The amount of dough this makes doesn’t seem like it would be enough to make such a large-looking braid and the bread bakes up surprisingly light and airy. 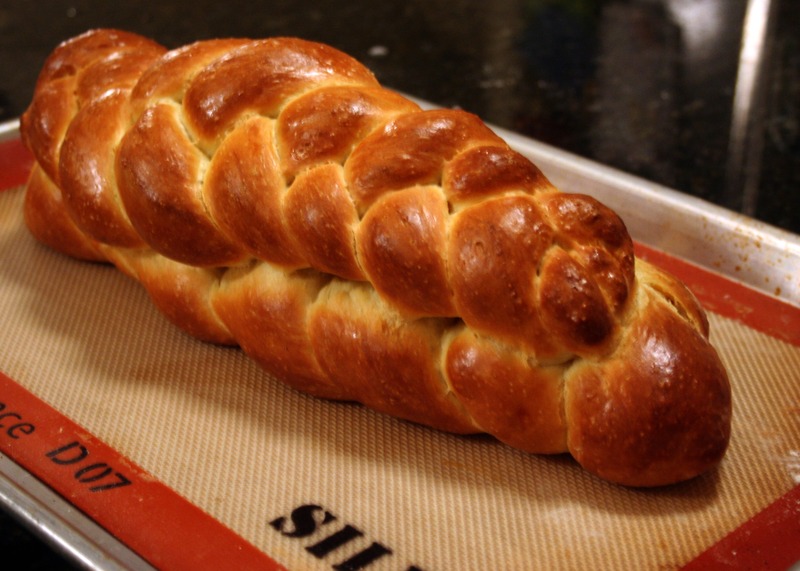 This is a slightly healthier version of a traditional Challah bread recipe. I didn’t mean to choose a healthier version, and I wont tell M this bit of information 😉 I decided to use grapeseed oil instead of the recommended olive oil, which replaced all the butter in the original version. I don’t think I have ever had Challah bread before, so I have nothing to compare it to, so maybe next time I will make the butter version. This loaf is destined to be french toast, and I wont feel bad if I add a little butter to the pieces later;) Thanks for reading, enjoy! Place all ingredients in the bowl of your standing mixer. Mix with the paddle attachment until combined, then switch to the dough hook. Knead for 5 to 7 minutes or until the dough is smooth, elastic and slightly tacky. Transfer to a lightly oiled bowl, cover with plastic wrap and let proof until doubled in size – about an hour. Gently punch down the dough, cover and let it rise for another 45 minutes. Cut off 1/3 of the dough (my digital scale takes all the guess work out, but if you’re more daring, you can eye-ball it). Divide the remaining dough into three equal pieces then roll out into 16 inch long strips. Braid. Take the remaining ball of dough and divide it into three equal pieces and make a second braid. Set the smaller braid on top of the larger braid and cover loosely with plastic wrap. Let it proof for 30 minutes and preheat your oven to 375 degrees. Lightly brush the top of the loaf with the egg wash and bake it for 30 minutes or until dark brown. Cool completely on a wire rack – at least 2 hours. Enjoy! Thanks for posting this, it looks completely brilliant – what an awesome colour! This loaf is so beautiful and shiny.